This essay by Naomi Wolf has been moving from blog to blog, as well it should. I’m posting it here so that at least a few more people will see it. Blackwater: Are You Scared Yet? The New York Times reported today that Blackwater, the infamous organization that has been accused of killing civilians in Iraq, “has been involved in a far higher rate of shootings while guarding American diplomats in Iraq than other security firms.” A mercenary firm in Iraq with an itchy trigger finger is bad enough. But it now appears that Blackwater’s activities may be massively expanded — and not in Iraq. In little noticed news, Blackwater, Raytheon, Lockheed Martin, Northrop Grumman, and Arinc were recently awarded a collective $15 billion — yes, billion — from the Pentagon to conduct global counter-narcotics operations. This means that Blackwater can be deployed to engage with citizens on a whole new level of intimacy anywhere around the world — including here at home. What is scarier than scary is that Blackwater’s overall plans are to do more and more of its armed and dangerous ‘security’ operations on U.S. soil. 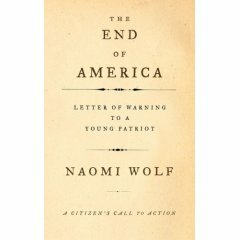 In my recently released book, The End of America — Letters of Warning to a Young Patriot, I describe the 10 steps that would-be tyrants use to close down a democracy and produce a “fascist shift.” The third of the ten steps is to ‘Develop a Paramilitary Force.’ Without a paramilitary force that is not answerable to the people’s representatives, democracy cannot be closed down; however, with such a force available to would-be despots, democracy can be drastically and quickly weakened. Every effective despot — from Mussolini to Hitler, Stalin, the members of the Chinese Politburo, General Augusto Pinochet and the many Latin American dictators who learned from these models of controlling citizens — has used this essential means to pressure civilians and intimidate dissent. Mussolini was the innovator in the use of thugs to intimidate what was a democracy, if a fragile one, before he actually marched on Rome; he developed the strategic deployment of blackshirts to beat up communists and opposition leaders, trash newspapers and turn on civilians, forcing ordinary Italians, for instance, to ingest emetics. Hitler studied Mussolini; he deployed thugs — in the form of brownshirts — in similar ways before he came formally to power. In light of these historical warning, we must ask, “What is Blackwater?” According to reporter Jeremy Scahill, the firm has 2,300 private soldiers deployed in nine countries, and maintains a database of an additional 21,000 to call upon at any time. Blackwater has over “$500 million in government contracts — and that does not include its secret ‘black’ budget…” [It also did not include, at the time Scahill’s wrote this description, the massive anti-narcotics contract described above.] One congressman pointed out that in terms of its manpower, Blackwater can overthrow “many of the world’s governments.” Recruiters for the company seek out former military from countries that have horrific human rights abuses and use secret police and paramilitary forces to terrify their own populations: Chileans, Peruvians, Nigerians, and Salvadorans. Blackwater is coming home to Main Street, and one of our key constitutional protections is at stake. The future for growth is directed at increased deployment in the US in cases of natural disaster — or in the event of a ‘public emergency.’ This is a very dangerous situation, of course, now that laws have been passed that let the President decide on his say-so alone what a ‘public emergency’ might be. How protected is Blackwater from prosecution for its crimes? The company’s lawyers have argued that Blackwater can’t be held accountable by the Uniform Code of Military Justice, because they aren’t part of the US military; but they can’t be sued in civil court, either — because they are part of the US military. Does this affect the strength of our democracy? Look at how history shows thug groups have been directed at intimidating voters. Americans need to be reminded that both Italy before Mussolini and Germany before Hitler were working, if fragile, parliamentary democracies. Thugs were used in both countries to intimidate voters exercising their rights. Mussolini’s fascists stood menacingly near voting booths to make sure citizens ‘voted responsibly’; William Shirer wrote that the Austrians voted 99% in favor of their country’s annexation by Germany — not surprising, he observed, since intimidating groups of brownshirts looked through a wide slit in the voting booth where the election committee did its work. The oddly specific scene of groups of identically dressed young men — later identified as Republican staffers — crowding and shouting at the vote counters in Florida in 2000 has strong historical precedents. The Founders knew from their own experience of standing armies, responsive only to a tyrant, how dangerous such a situation was; King George’s men — armed with blanket warrants — invaded the colonists’ homes, trashed their possessions, and even raped Colonial women. It was that bitter experience that led them to insist on the second amendment — ‘a well regulated militia’ that was responsive to the people and could not be deployed against the people of the United States by would-be despots. The founders knew that American tyranny was not only possible, it was likely, in the event of weakened checks and balances; and they knew a mercenary army was the advance guard of despots. Blackwater is available to anyone who can write the checks. If there is a need to ‘restore public order’ in the next Presidential election — a power that the President now can define as he sees fit — Blackwater can be deployed. If the President declares an emergency, Blackwater can be deployed. And history shows us how very quickly citizen dissent and democratic processes close down when physically intimidating men — who are armed and not answerable to the people — are abroad in the land. Those who read history should understand what we are more and more likely to see — now that a paramilitary force answerable to Bush and corporations like Halliburton but not to the people’s representatives is in place. Mussolini and Hitler began to deploy their paramilitary to patrol key public spaces early — when Italy and Germany were still parliamentary democracies and neither leader had yet seized power. These leaders deployed their paramilitary groups in the halls of Parliament and the Reichstag when these were still functioning representative democracies, thus intimidating the people’s political leaders. Then the paramilitary groups were deployed to violently contain opposition protests — again, in what were still open, if fragile, democratic societies at the time. I went up to a guard and, chatting sweetly, established from him that, indeed, none of these men were NYPD or even US government agents. “It’s a Glock,” said the contractor, with shy pride. “Use our discretion,” he said. I thanked him, my heart racing. In Iraq, men with guns not answerable to the people’s law or government can shoot at will at Iraqi civilians. That is not freedom. As Blackwater or other renamed versions of paramilitary contractors, sometimes with intimate ties to this administration and to Halliburton, start to patrol the streets of our nation, without our debate or consent, we can easily wake up to find that we have a National Guard that is supposed to be answerable to governors, and a Congress that is supposed to oversee the military — but it’s too late anyway; the guns in our streets are already in the hands of people who are answerable to those writing the checks — and no longer answerable to the now-vulnerable American people. Blackwater’s actions in Iraq should be a wake-up call to us here at home — to restore the constitution and the rule of law before we are too intimidated to do so. Naomi Wolf’s essay is more than sobering. It’s chilling and, of course, it’s right. But just as weathermen and women on American tv simply cannot bring themselves to utter the phrase “global warming,” news anchors on all stations cannot bring themselves to use the word “mercenary,” with regard to Blackwater. But that is what agents of Blackwater are: mercenaries supported with tax-payer money, but without tax-payer consent. Our democracy is sick, and many people—cowed, blind, fearful, incredulous—cannot be brought around to see it. Everything and anything can be done in the name of “Homeland Security,” a phrase that chills the blood as well. “Homeland” is a word that was coined during the Bush administration by Republican hacks (before that, it was “National Security”, period), and it is directly related to Hitler, Stalin and Mussolini. It is no different, connotationally, from “Father land,” though skillfully (or not so skillfully) disguised to hide any intimations of the authoritarianism contained in the word “Father.” King George III hired Hessians, those German thugs the colonists feared above all others for their careless, insensitive brutality. Our George, that benign Christian father, hires Blackwater, for the same reason: their careless, insensitive brutality. It’s another step, along with domestic spying and suspension of habeus corpus—among other things—to destroy our democracy and have the paramilitary power to enforce the destruction and make sure the country remains under control. How many years before your blog, my comments here, and Naomi Wolf’s book get us all rounded up and tossed into jail? I don’t know, but I know it’s possible. More possible every day. What key words in this text will alarm monitors at the CIA and other U. S. intelligence agencies already dragging the internet daily for signs of “terrorism” and suspicious domestic dissent? But, of course, I have nothing to fear because I have done nothing wrong but exercise my right to free speech. The Constitution will protect me. Won’t it?